Index ETF shares are very popular vehicles for short-term traders and also for ETF investors placing these funds for their mid-term or long term ETF portfolio. But what are really the most popular exchange traded funds? I used ETF screener to find the answer to this question. I used a screener available on the FinViz website to find the most liquid ETFs traded on US stock exchanges. I sorted the list of all ETFs by trading volume and received this list of top index ETF shares traded on the U.S stock market. The most liquid ETF is SPY that tracks the S&P500 stock market index. This ETF is used for all types of strategies from very short term daytrading to long-term index investing performed by long-term passive investors. The second most liquid fund is VXX. This is very special iShares ETN – exchange traded notes. It is something like exchange traded fund but based on notes. These notes track the movement of volatility. This instrument is used mostly for daytrading of volatility. The next two tickers represent international markets. Japanese market is represented by EWJ, iShares Japan ETF. The broad list of emerging markets is covered by iShares Emerging Market Index with ticker symbol EEM. Other two important tickers can be found in this list. The PowerShares QQQ is the Nasdaq-100 index tracking fund. IWM, iShares Rusell 2000 Index fund tracks the major Small Cap index of US stock market. These two ETFs are used for a broad range of strategies – daytraders like to use QQQ, but swing trades or position trades with IWM or QQQ are also very profitable way to make money on US stock market. There are also some leveraged funds in this list, UVXY – ProShares Ultra VIX Short-Term Fut ETF, NUGT – Direxion Daily Gold Miners Bull 3X Shrs and TZA – Direxion Daily Small Cap Bear 3X Shares. 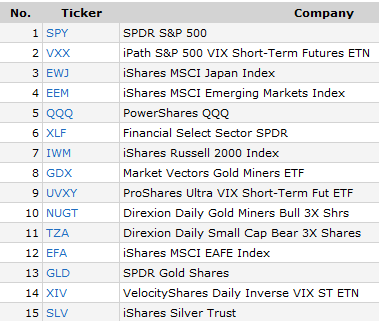 These leveraged and inverse ETFs are preferably used for daytrading strategies.